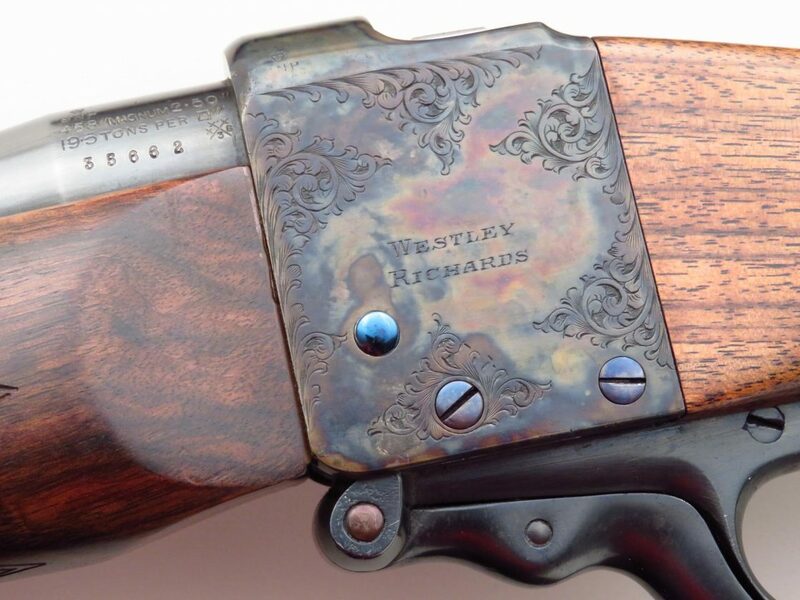 Westley Richards pair Model 1897 rifles in .458 Winchester Magnum, consecutive serials, engraved & cased - Sportsman's Legacy, Fine firearms, related books and sporting collectibles. Representing estates, collectors and nonprofit conservation organizations. Westley Richards Model 1897 (New Model dropping block) matching pair of .458 Winchester Magnums with consecutive serial numbers. 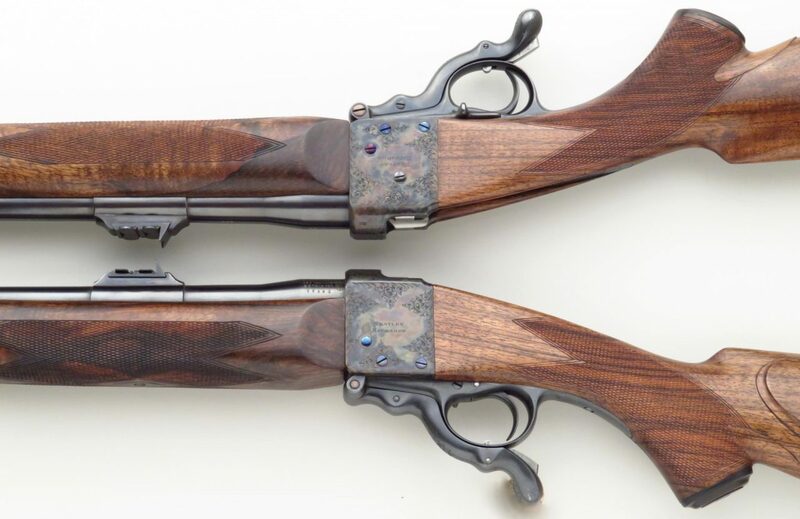 According to British Single Shot Rifles – Volume IV, it is estimated that Westley Richards produced fewer than 700 single shot actions in both 1891 and 1897 configurations, with the sliding side safety versions (such as these) being the least common. That a pair with consecutive serial numbers remains together after all these years is most improbable. 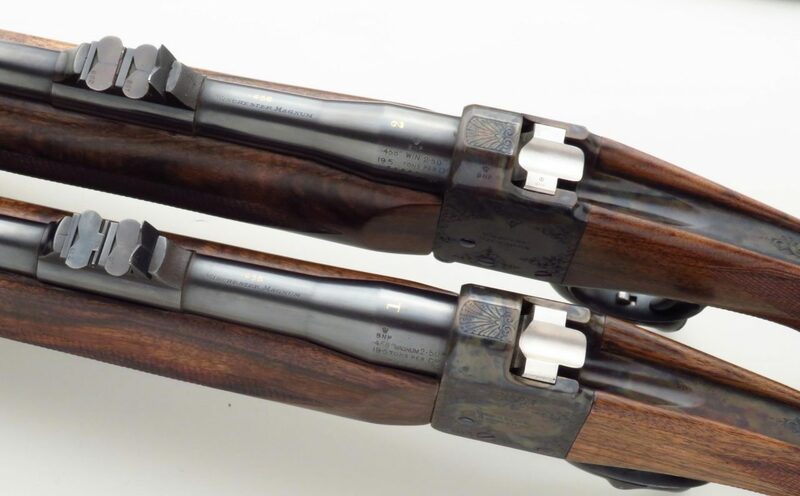 Rifles Number 1 (35662) and Number 2 (35663) are serialized on barrels and the inside leading edges of the actions. As the actions are also marked “450”, it is likely that the original chambering was .450/400. Said to have been factory refurbished in 1973, they were no doubt restocked and rechambered at that time. Features shared by both rifles include 25.5-inch sporter-contoured barrels with hooded bead island front sights, barrel-mounted sling hook eyes, banded rear express sights with one fixed express leaf and two folding express leafs (marked “100” and “200”), leaded (for weight) and bedded (for strength) oversize forends, sliding (mechanical) side safeties, cranked and serrated opening levers, extractors, niter blued pins, traditional English cheekpieces with shadow lines and recoil pads. DIMENSIONS: Weights are approximately 8.5 pounds. Length of pull is 14.5 inches, drops are 1.5 and 2.75 inches, and cast (off) is approximately .5-inch. ENGRAVING: Gun numbers and “.458” appear in gold on the barrels. Receivers and opening levers wear a classic scroll to about 50% coverage. 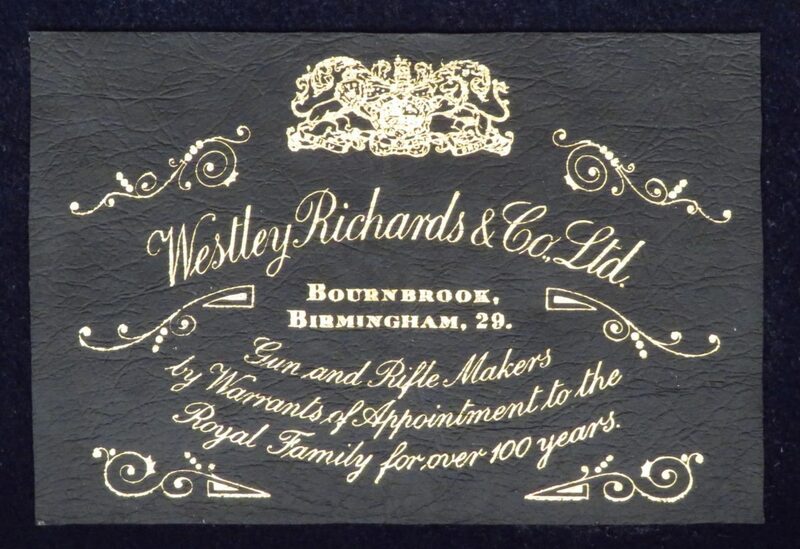 Barrels show a single line “Westley Richards & Co., London”, and “Winchester Magnum” subbordinates the gold “.458”. 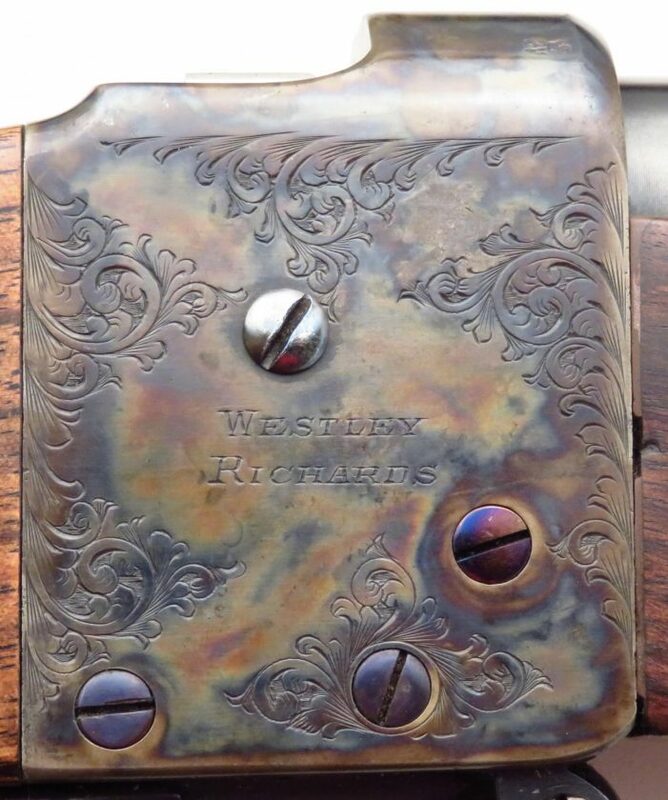 “Westley Richards” is centered on either side of the receivers as well. CONDITION: As refurbished and restocked, each rifle rates about 98% overall. Both bores are strong and bright. Receiver colors are vivid. Both safeties slide very easily. Rifle number 1 has a slight chip on the right side of the forend at the action. Opening lever and lower tang have slight roughness beneath the blue. The bottom of the recoil pad has a puncture. 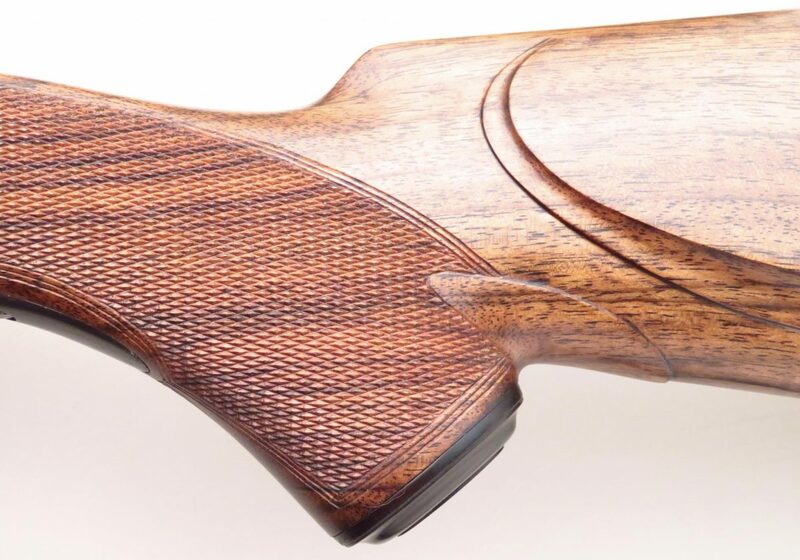 Rifle number 2 has a pair of small marks visible under the colors on the action (right side), the grip cap has finished-over scratches. CASE: Canvas with brass corners, initial plate (blank), twin leather straps and central lock. Inside is navy blue felt with maker’s label on upper lid. Accessories include silver oiler, rod with tips, snap cap and (ebony-handled?) screwdriver. Case condition is very good, with some fabric staining on the exterior. Interior is nearly new.